The advantages of running inside the DAW are a few. The user can record the mixing that is being performed directly inside the DAW, use an “unlimited” number of decks and create personalized FX chains! 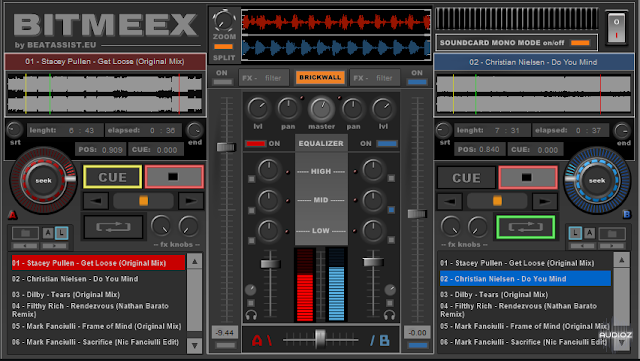 BitMeex simulates 2 decks with basic features enough to mix your songs! This software only runs .wav and .aif files and is designed for beginners. It outputs the Master through channels 1/2 and the PFL through channels 3/4…so a 2.1 Audio Card is needed! The MIDI can be mapped by “right-clicking” a control of BitMeex and turn the MIDI control of the controller! For now, BitMeex is only distributed as 32-bits version for Windows, but a 64-bits version is being thought! BitMeex is free and works on Windows 32-bit, Windows 7 Windows 8 and Windows 10.